Little is known about the Fremont people, the collective name given to a band of pre-Columbian Native Americans who eked out a living among the dry rocky canyons of Utah and Nevada. 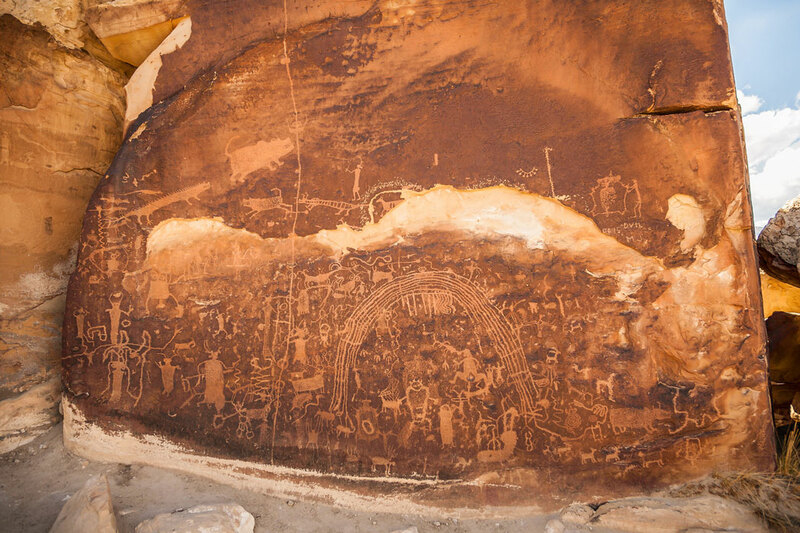 And even though we may never know what caused the Fremonts to seemingly disappear, clues to their culture and way of life still can be found in the petroglyphs they etched in the salmon-colored rocks near Emery, Utah. One of the best preserved of these images is simply known as the “Bird Hunters,” an etching that shows six Fremonts headed back to camp, each carrying a harvested bird. When I first saw this petroglyph, it so happened that I was bird hunting with Castle Valley Outdoors in the same drainages and valleys where the Fremonts had pursued their quarry a thousand years earlier. This past fall photographer Ben Gettinger and I flew into Salt Lake City and drove about four hours to Castle Valley Outdoors, located in an area that was once home to the Fremonts. The landscape no doubt has changed since the days when primitive hunters chased native quail and grouse there, but the high-plains desert around Emery remains a bird hunter’s paradise. In 1990 Glendon Johnson, a Harvard Law School graduate and Utah native, and his son, Woody, purchased 15,000 acres in Castle Valley. At its inception, Castle Valley Ranch was a cattle operation. Glendon and Woody owned a herd of about 6,000 cows and calves, but Glendon had always been more excited about seeing wildlife on his land than cattle. So in 1999 he hired Jim Fauver as his ranch manager. In 2000 Glendon expressed to Jim that he’d like to turn Castle Valley Ranch into a wingshooting lodge, and in 2006 that dream became a reality. The lodge at Castle Valley Outdoors offers rustic luxury, including re-creations of some of the nearby petroglyphs at its focal center. The sweeping valley is a picturesque backdrop to the core of the experience: excellent guides and dogs leading hunters through habitat managed for gamebirds. 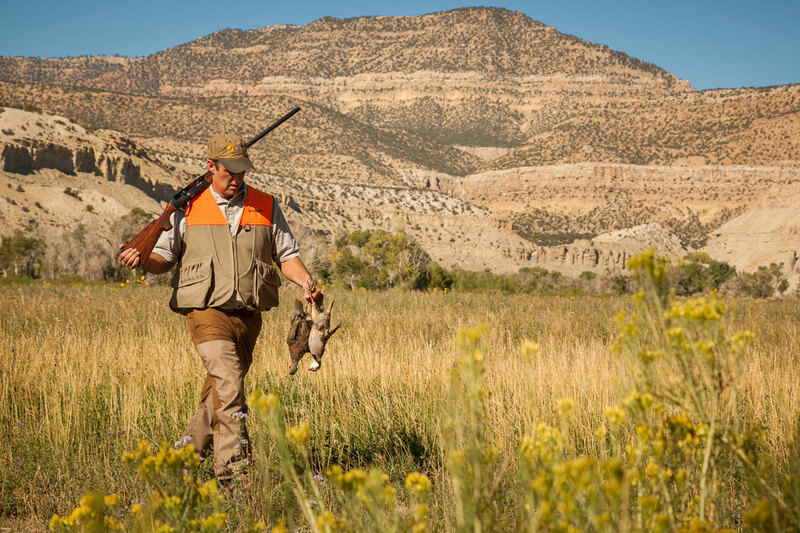 Twelve fields offer walk-up hunts, though guests can opt for wild-chukar scrambles in the canyons or Continental-style shoots for high-flying birds. “This is Muddy Creek,” Jim explained as we looked down the length of the river course that is lined on both sides by a row of green willows that grow at the water’s edge. 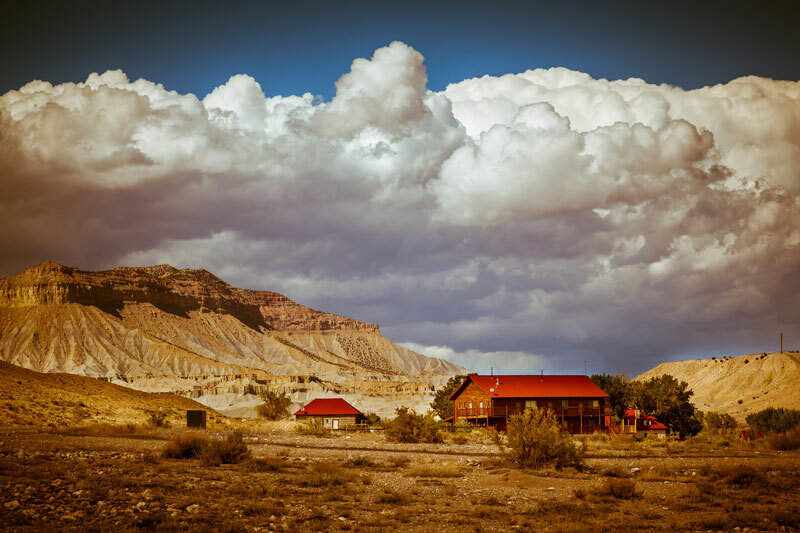 The entire valley is surrounded by the dry, rocky foothills of the La Sal Mountains, which appear painted red, gray, brown and violet in the afternoon light. “We have about twelve-thousand acres here now,” Jim continued, pointing back toward the town of Emery. “This has always been a working cattle ranch.” Today Castle Valley runs about 3,000 head of Angus-cross cattle, but if you visit, don’t expect to see great herds roaming the fields and cowboys on horseback. The cattle operation is located on the opposite end of the ranch from the lodge. At Castle Valley’s main guesthouse you’re far more likely to hear the chortle of a chukar than the bellowing of a steer. The entire landscape around the lodge seems untouched—as barren and beautiful as it likely appeared in the time of the Fremonts. 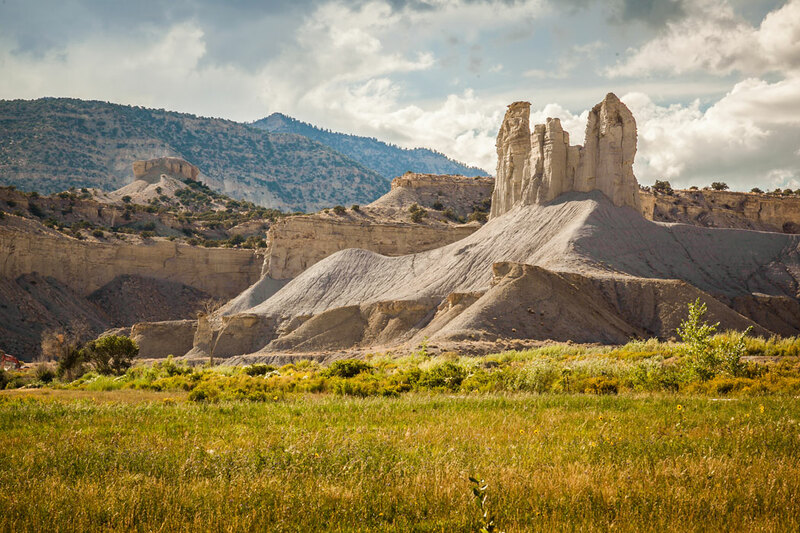 Castle Valley manages about 4,000 acres of habitat strictly for bird hunting. The ranch’s 12 bird fields are planted with a special blend of wheat grasses and grains, a mix that was formulated for Castle Valley by local biologists who understand the nutritional and habitat needs of birds on the High Plains. Early release birds are provided with plenty of cover and food, so they have a better survival rate and are better protected from predators. In addition, efforts are made to control predators year-round. The following morning our hunt began at first light, as the starry desert sky gave way to the first blue-gray streaks of dawn. 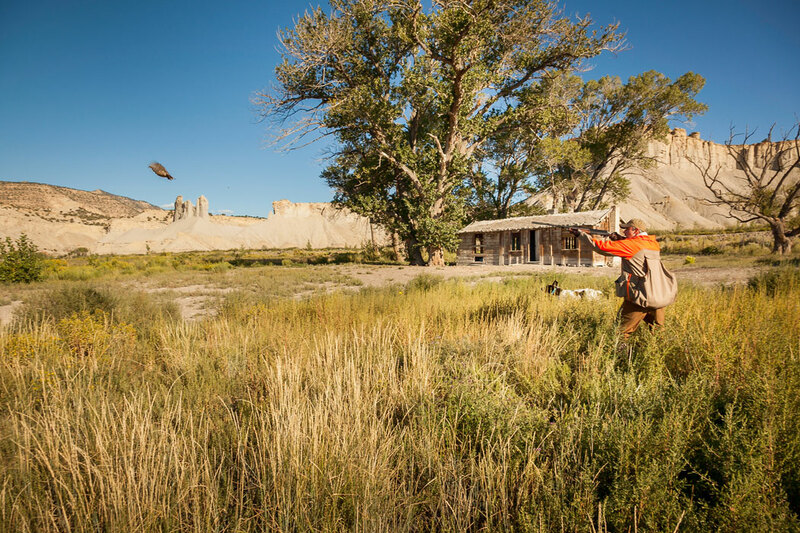 Castle Valley allows up to five Guns with a single guide and, with no daily bag limits, hunters can enjoy ample shooting. We met with Jim and guide Jeremy Lake, who took us to a long, narrow valley surrounded by elephant-gray hills—a streak of green pinched between gray cathedrals of stone. This valley, with its tall, stone pillars, or “castles,” gives the lodge its name, and the spires that rise up around the valley provide an impressive backdrop for a hunt. It wasn’t long before Vegas and Beretta, Jeremy’s brace of German shorthairs, went on point in the tall grass. “Here,” Jeremy said, waving me forward. Beretta was locked solid, her stubby, chocolate-colored tail just visible above the milo, as Vegas backed. I had just begun my slow push through the waist-high grass when a chukar rose straight up and drummed away toward the tall, stone castles on the far end of the field. I caught up to the bird with my Beretta Ultralight, and when the 28-gauge clapped, the chukar fell from the sky. Soon there was another point, this time on a pheasant. The rooster came cackling out of the milo almost underfoot, rising into the cloudless sky. I made the shot, and the dogs were on the bird quickly. My shooting skills dried up on the next pheasant, which rose far out and made a frantic quarter-turn. Both of my shots were behind and did little more than stir the rooster’s long tailfeathers. Ben took a pheasant near the end of the field, and then another just shy of a row of cottonwoods that served as the boundary between our field and the next. As we continued our sweep through the milo, Ben’s luck continued as he collected a bobwhite from a sizeable covey. One nice thing about hunting the West is that you never know what bird species you’ll encounter next. Castle Valley is best known for its pheasant hunting, but during our morning’s hunt we found chukar, bobwhites and California quail as well. Such variety means that hunters must be ready for anything, from high-flying roosters to scattering coveys. Fortunately for me, we had plenty of opportunities that morning, and I was able to redeem myself with another rooster and a double on chukar. I didn’t take any quail, but Ben collected a plump California cockbird when we flushed a large covey that made the mistake of turning in his direction. Hunters interested in a more physical challenge can opt to chase wild chukar in the canyons, though the terrain is tough and there is a lot of loose rock. In the higher elevations juniper-covered slopes are home to grouse, and though there are fewer birds there than in the valleys, the thrill of chasing wild quarry can be irresistible. For the hunter who chooses to stay on the beaten path, Castle Valley’s managed fields eliminate the need for a lot of vertical hunting, which can take a toll on even the fittest hunters. In a full day of hunting at Castle Valley, Ben Gettinger and I took two dozen birds. We could have taken many more if we hadn’t stopped for photographs and interviews. We hunted only two of the property’s 12 fields, so there was plenty of land left to cover. Perhaps next time I’ll try for chukar in the rocky draws and canyons, as challenging as any bird hunting in North America. As Ben and I headed for the airport, I thought about the Fremont people and how they carved out a living in the harsh environment around Castle Valley. I thought about the petroglyphs they left behind chronicling their way of life. 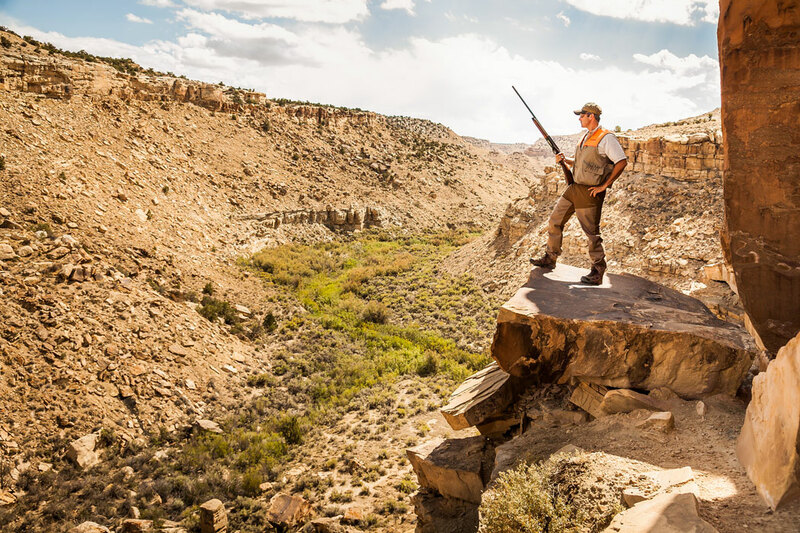 The images somehow serve as a connection between the modern era and a more primitive time, a gap of more than a thousand years bridged by the pursuit of gamebirds in a remote and rugged valley in central Utah. Castle Valley Outdoors offers bird hunts from early September through March. The 10,000-square-foot main lodge boasts 15 single rooms as well as a pro shop and a gun room with a variety of shotguns available for rent. The lodge maintains a kennel full of well-trained and -conditioned shorthairs and vizslas, though hunters can bring their own dogs if they choose. 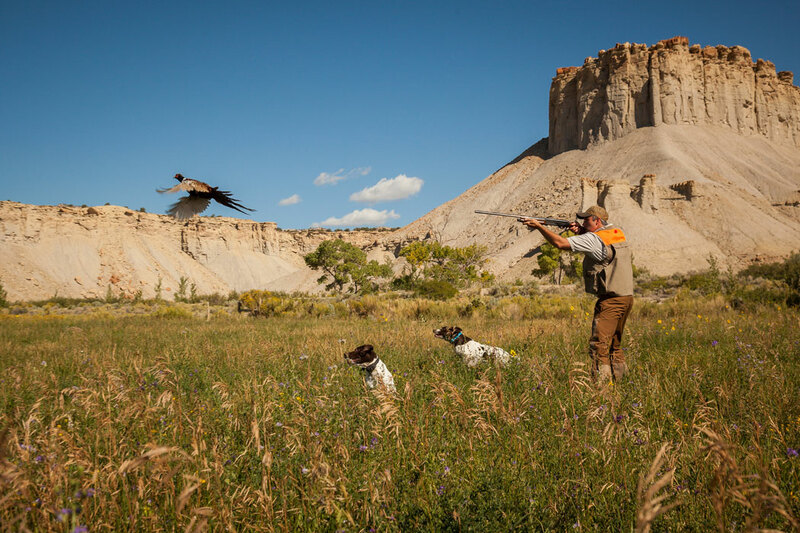 In addition to traditional walk-up hunts, Castle Valley offers Continental-style shoots where hunters are positioned at the bases of tall sandstone cliffs and shoot birds rocketing overhead. Castle Valley also offers hunting for elk, mule deer and mountain lions as well as coyotes and prairie dogs, and the region boasts outstanding fly-fishing. There is a large, stocked lake beside the main lodge where guests can spend the evening hours casting for trout, and the lodge’s sporting clays range will help remedy any shooting problems. For more information, contact Castle Valley Outdoors, 800-586-6503.